And when I say “not interested,” I don’t mean indifference. It was more like anger. I wasn’t quite sure whether to feel pride or exasperation when my two-year-old loudly told me to speak in English when I tried reading her Spanish board books. At least she recognized it was Spanish I was speaking? And my eldest quickly realized that learning Spanish was one of the rungs of a ladder leading thousands of miles away from her family and friends. She told me over and over that she wanted nothing to do with Spanish, Argentina, or my brilliant ideas. I felt for the kids. See, I wanted our time abroad to be pleasant. Every word, every phrase would pave the way for more words, more connections, more friendships. If they arrived in country with nothing? If they refused to speak Spanish while we were there? Our whole experiment in getting them competent in Spanish would fail. And I wondered: Should I insist my eldest learn something she was actively opposed to? Should Spanish be an exception to our interest-led approach to learning? And what would I do when she became angrier and angrier at me? I took a few deep breaths. I considered my options. And then I realized I was choosing to be afraid, but I could choose differently. I was afraid because my expectations were not matching up to reality. But instead of reacting out of fear, I could simply adjust my expectations. What if we got to Argentina with absolutely no Spanish? Would that really be failure? Maybe they wouldn’t be fluent—or even competent–when we came back home. But if I didn’t force the issue now, I knew I had a much better chance of them having a good attitude in-country. I know how terrifying the prospect of moving abroad is. I’m terrified myself, and I’ve done it before. So I chose to radically change my expectations of my daughters. Perhaps this trip would only expose them to Spanish. Perhaps more language practice would come after we came back home. Or if we have a good time with our adventure, perhaps they would want to do something similar in a few years, and would then be willing to study language on their own steam. Stepping back from my fear and my expectations, I could see that I’d been using all-or-nothing thinking. And that thinking was a lie. I decided to let God be in charge of their language learning. I also decided to let them watch as many Spanish videos as they wanted each day, if they were interested. They mostly weren’t. But they were a little. And then more so. And then they said yes to a few Spanish music CDs with accompanying songbooks. We listened to them in the car, and sang along, happily. The iPad apps proved popular too. 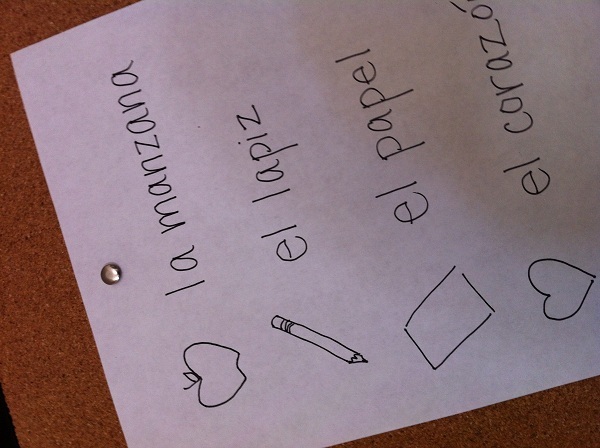 The oldest wanted to practice a few words before a Spanish-speaking friend came over. She said yes when I asked her if she wanted to attend a Spanish language class come fall. They’re happy to do so. And me? I’m no longer afraid. More and more I’m seeing that if God led us to try this crazy adventure then He can provide the tools to make it happen. I’m a worrywart. Trusting God and my kids doesn’t often come naturally. But as an overall philosophy it—surprise!—is proving a better bet than the alternative. ~ Today’s guest post comes from Heather at A Little Yes.